Over the last century the Irish heating industry has changed dramatically, growing and innovating at an unprecedented rate to provide greener, cleaner heating and hot water solutions tailored to the needs of the modern consumer. But amidst all this change, one name remains the same – Baxi. Today’s high-efficiency boilers, renewable heating solutions, smart technologies and state-of-the-art training centres are a far cry from Baxi’s humble beginnings in Lancashire, north England, where founder Richard Baxendale began the Baxi story. Ironmoulder Richard Baxendale started out in 1866 building railway wagons from wood, iron, steel and brass. After 10 successful years, the business went under after the world depression of 1879. But, two years later, Baxendale was back in business in Chorley as Richard Baxendale and Sons: Engineers, Millwrights and Machinists. In the 1930s, a concept created by Richard’s grandson John became the company’s first product for the heating market and the first to use the Baxi name. Launched in 1935, the Baxi Patent Fire was an underfloor draught system for solid fuel heating. Throughout the 1950s, the company became increasingly focused on the domestic heating sector and Baxi quickly became a household name. In the 1960s, Baxi saw a growing trend for gas products and appliances and began to develop its own range of gas boilers and heating products. In 1966, the Baxi Bermuda was launched, taking the market by storm with its unique offering combining a living room gas fire with a back boiler small enough to fit behind the hearth and providing domestic heating and hot water. The Baxi story didn’t reach Irish shores until much later in the company’s history. Baxi began selling gas boilers in both the Republic and Northern Ireland as natural gas first became available in the 1980s and 1990s. This coincided with the company developing into a wider group when it acquired the assets of Blue Circle heating, including Potterton domestic boilers. The Baxi range of boilers changed from their origins of gas backboilers to the wall hung ranges that preceded the condensing technology available today. 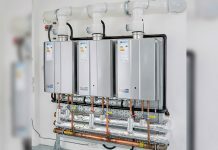 The company evolved into a wider solutions provider with the addition of commercial heating and hot water brands Potterton and Andrews Water Heaters in addition to the electric heating business Heatrae Sadia before merging with the De Dietrich and Remeha group in recent years. This ability to change has meant Baxi holds a market-leading position in almost all European markets, and Ireland is no different with products such as Baxi Ecoblue being at the leading edge of gas product available today. The social housing market in Northern Ireland was particularly welcoming of Baxi and its products. Working in conjunction with the Housing Executive, the Baxi Bermuda was a popular installation in many homes. Later on, the wall hung Solo boiler became a widely installed alternative to the Bermuda back boiler, along with the Duo-tec and Solo HE. Baxi later worked with Firmus Energy and contractor H&A Mechanical to produce boilers exclusively for the social housing stock in the Firmus gas area. Baxi worked alongside Phoenix Natural Gas to promote the Bahama and Barcelona products to one-off installers but it wasn’t until October 2000 when Baxi made a real mark on the Northern Ireland heating market with the launch of the 105e combi boiler. 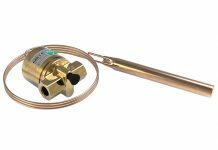 It was the first cost competitive combi on sale in Northern Ireland, helping to promote the benefits of gas to the wider public, and, to date remains Baxi’s most successful product sold in the region. The launch of Baxi Ecoblue in 2014 made waves in the Republic of Ireland in particular. 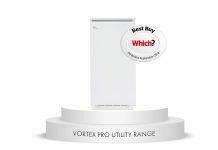 Representing a landmark in product innovation, it’s currently the best-selling Baxi product in the region, offering both reliability and efficiency. In 2015, the Ecodesign (ErP) Directive was introduced for heating products across Europe. Baxi ensured its products were compliant and met the needs of its Irish customers, and invested in support work to ensure its installers and supply chain in Ireland understood the implications of the Directive. Education is an important element for Baxi’s activities in Ireland, having opened state-of-the-art training facilities for installers in Dublin and Newtownards. 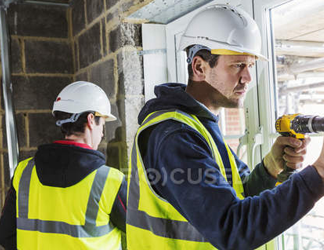 The company’s training centres allow engineers to test live solutions and fault-find, giving them invaluable experience of real-world situations. Today, Baxi has the largest market share of all boiler manufacturers in the Republic of Ireland. In the UK and Ireland, Baxi is a leading UK boiler manufacturer employing nearly 1,600 people. The company has a factory in Preston, close to where the company began 150 years ago, where it makes over seven million components each year. It is the only UK boiler manufacturer with its own foundry and its paint shop has been benchmarked by Mitsubishi. From new technologies to an app for installers, Baxi continues to innovate and find new ways to inspire loyalty and support from its customers, adapting to the changing landscape and ensuring the Baxi name remains synonymous with the heating industry for many more years to come. 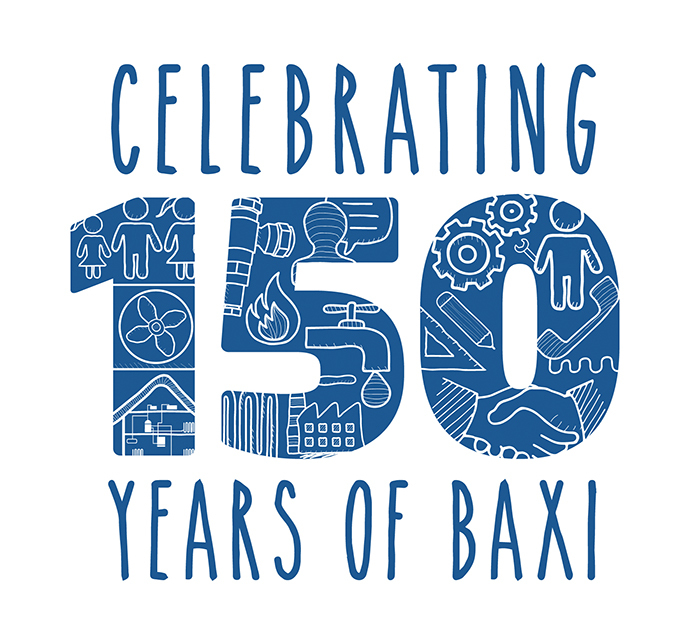 As part of the 150th anniversary celebrations, Baxi is inviting installers to share their happy memories of the company by e-mailing a message and photograph of themselves to [email protected] Each story will be entered into a commemorative online book hosted on the Baxi website, and each photograph will become part of a 150-shaped montage of images.